Participants will take their gear to the Manito-wish Leadership Center from 7:30am until 9am. No personal listening devices (iPods, radios, and mp3 players) are allowed during this entire event. Once the clock starts it does not stop until you cross the finish line by bike. All transitions are timed as part of the race. From Main Street in Boulder Junction, follow Highway K west and drive approximately 1.5 miles to the east entrance of Camp Manito-wish YMCA. Look for the banner and flagging. Take a right turn into the camp and follow the signs to the Manito-wish Leadership Center. Pull in to the Manito-wish Leadership Center parking lot on the right (this will be signed) and circle around to the transition area. This will be a single file flow of vehicles. Unload your gear as quickly as possible. Place your equipment in the staging/transition area. 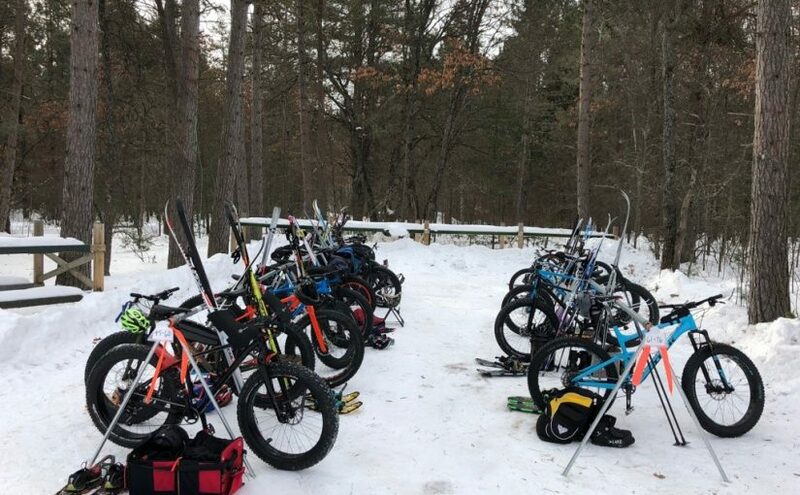 There will be racks set-up outdoors, numbered with your bib number with room to hang your bike, place your skis upright without falling, snowshoes and other necessary gear. You are responsible for your own seating. Bring a bucket or small folding chair. Limited indoor changing is available. After your drop-off please continue left down the road you came in on, the east entrance of Camp Manito-wish, to the designated racer’s parking area on the left, ¼ mile from the Manito-wish Leadership Center. Walk back ¼ mile to the Manito-wish Leadership Center & starting line. All participants should have gear at transition area and be prepared to start the race at Camp Manito-wish by 9am. The cross-country ski portion of this event will begin at the designated start line near the Manito-wish Leadership Center. All participants should be at the start line to line up 10 minutes before their start time. Check-in will take place just before you enter the course. If you miss your start time, you will have to start at the end of the line. The clock will not be reset, it begins at your original start time. Two triathletes will be released, every 30 seconds. Expert levels will start first, followed by intermediate then beginners. Classic Ski on right/Skate Ski on left. Pass with care. Follow signs, stay on the trail. Please be courteous to other racers at all times. Approximately 50 feet before the timing arch the trail will be shared with skiers, snowshoers and bikers. Participants will pass through the timing arch which is located at the end of the trail, cross the street (road will be closed) and enter the transition area. Passing through the arch will stop ski time and begin the snowshoe leg of the race. The transition from ski to snowshoe will be timed as part of the snowshoe course. The snowshoe portion of this event will begin at the designated starting line near the Manito-wish Leadership Center/Transition Area. This is a different starting line than the cross-country ski and will be clearly marked. Please snowshoe on the far left of the trail leading to the timing arch. Participants will pass through the timing arch which is located at the end of the trail, cross the street (road will be closed) and enter the transition area. Passing through the arch will stop snowshoe time and begin the biking leg of the race. The transition from snowshoe to bike will be timed as part of the bike course. Helmets must be worn and buckled at all times during the biking leg of this event. If they are removed during this timed section, you will be disqualified. Failure to heed the commands of a race official means disqualification. Bikers must walk their bike while in the transition area until the entering the designated trail to the bike course This is the same trail leading to the snowshoe course. The bike course is the same course as the cross-country ski. Please do not bike on the classic track. Follow signs, stay the on trail. Please be courteous to other racers at all times. Approximately 50 feet before the timing arch the trail will be shared with snowshoers. Participants will pass through the timing arch which is located at the end of the trail. This is the finish of the race. You will again cross the street (road will be closed) and enter the transition area. Please walk your bike when in the transition area. If your bike breaks down, please remove yourself from the course and a race official will be on the course to assist you in getting help. If at any time you cannot complete the race for any reason, you must let a volunteer know so that we know you are safely off of the course and back at Leadership Hall. Transition area will become congested, so it is advised that you begin early and allow at least 1/2 hour to drop off equipment at the transition area, beginning at 7:30am until 9:30am. Volunteers will be there to assist you. Equipment pick-up is NOT permitted until the last racer crosses the finish line. Pull out of the designated racer’s parking area and turn to the right to come back to Manito-wish Leadership Center, pull in parking lot as you did in the morning and circle around to the transition area on your right. Pull off to the right out of the way of other vehicles and load your gear. After pick-up please continue left down the road you came in on-the east entrance of Camp Manito-wish to Hwy K. Take a left turn on Hwy K to return to downtown Boulder Junction. All equipment must be picked-up no later than 4pm. Designated parking area for the race is located ¼ mile south from the Manito-wish Leadership Center on Camp Manitowish Lane. Overflow parking will be on the west side of Camp Manito-wish Lane. Spectators are welcome to cheer on the triathletes outside the Manito-wish Leadership Center, which is where the start and finish line of the race are located. We ask that spectators also park in the designated parking area ¼ mile from the Manito-wish Leadership Center. Spectators are NOT allowed on the trails. Camp Manito-wish YMCA: Camp Manito-wish YMCA is an alcohol free and tobacco free property. No pets are allowed on campus. Thank you for respecting this beautiful property.